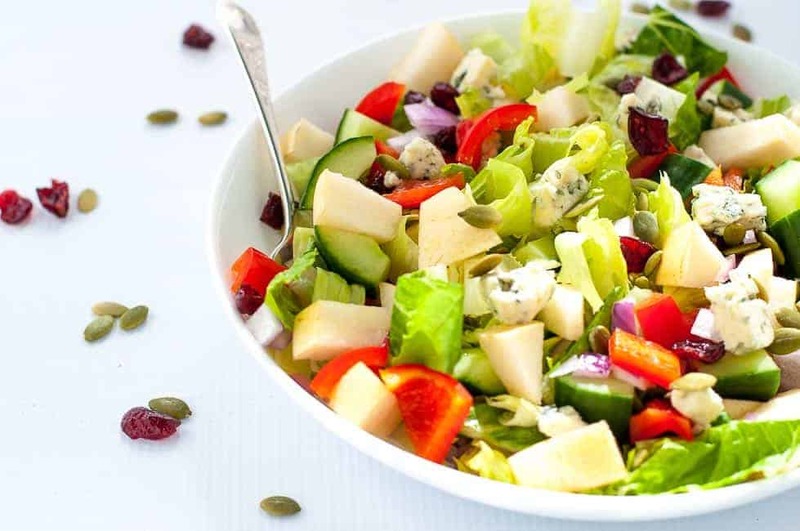 This colourful Asian Pear and Cranberry Chopped Salad is bursting with crisp pears, crunchy vegetables, sweet cranberries and tangy blue cheese, all on a bed of fresh crisp lettuce. It’s a family favourite, perfect for potlucks. This cheerful Asian Pear and Cranberry Chopped Salad brightened up our dinner several times this week. When the skies are grey, the fog rolls in and the weather forecast shows nothing but clouds, rain, and more rain, I crave colour in my diet. This salad is crisp and colourful and it was an ideal antidote for the boredom of drizzly days here on the West Coast. Chopped salads provide more bang for your buck than green salads. Every forkful offers more interest, variety, texture and nutrition than a simple leafy green salad. We love this Crispy Fennel Apple Chopped Salad with Walnuts and this Fennel Apple Chicken Salad with Pumpkin Spice Pecans. Today, however, I was craving pears so this healthy chopped salad was the result. I always feel uncomfortable when I’m out for dinner and I’m faced with a bowl of large leafy greens that are simply impossible to eat politely! When you make this Asian Pear and Cranberry Chopped Salad, cut the greens into small bite-sized pieces. They’ll co-operate by staying on your fork along with the other fruit and veggies, and you’ll make the transfer from plate to mouth with a minimum of fanfare. 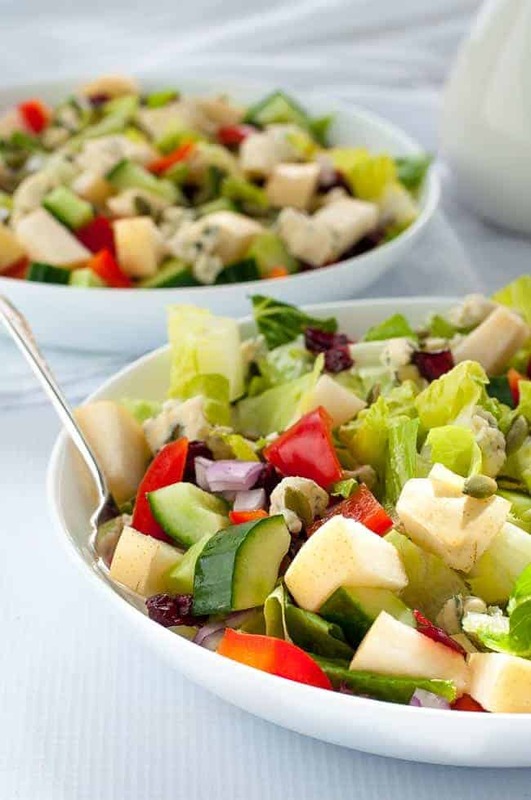 While I’ve made this salad using different types of pears, our favourite is the Asian pear, (sometimes known as apple pear.) 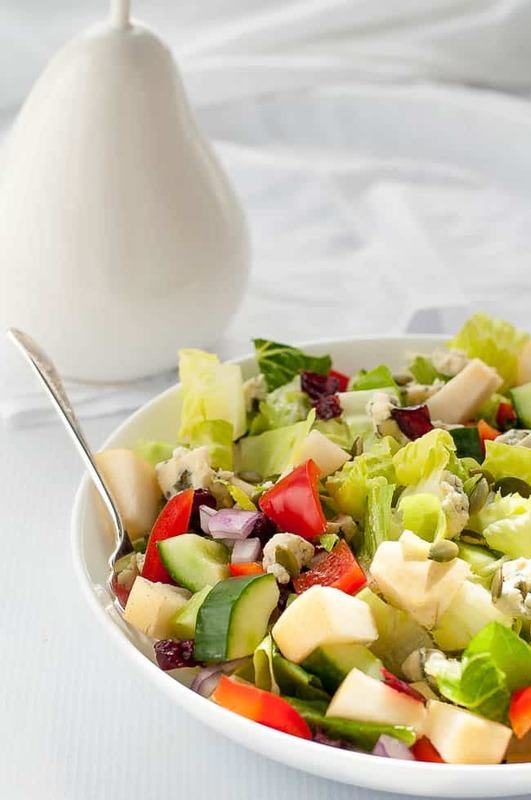 It adds a significant crunch factor to this chopped salad. 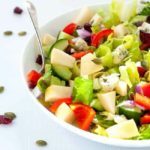 An Asian pear is sweet and crispy and it complements the tangy blue cheese and sweet cranberries in this vibrant salad. Cucumber and pumpkin seeds add more flavour and texture. I dress this salad with a simple emulsion of oil and vinegar with a little salt and pepper. I hope you get a chance to brighten your day and make this salad one day this week. It’s just that good! 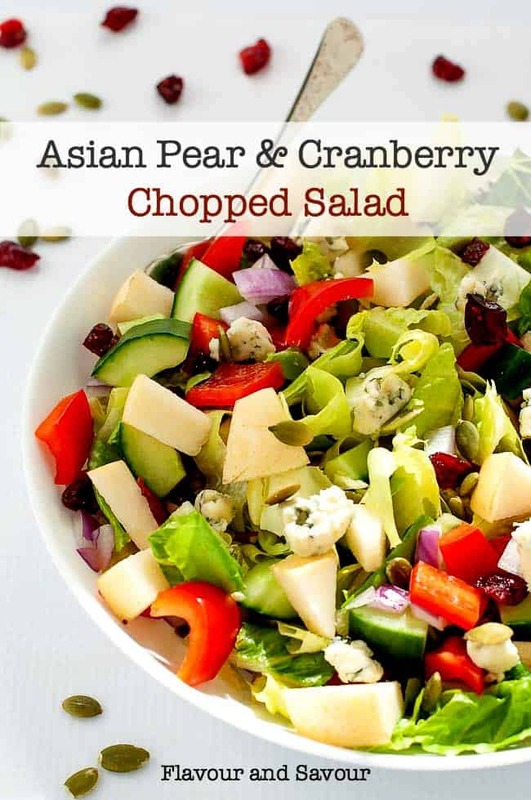 Can I make this Asian Pear and Cranberry Chopped Salad ahead of time? First, wash, dry and chop the romaine and refrigerate. Next, chop the remaining ingredients fruit and vegetables. Combine in a bowl and refrigerate. And finally, just before serving, top the romaine with the pear mixture and garnish with blue cheese and pumpkin seeds. This colourful Asian Pear and Cranberry Chopped Salad is full of crisp pears, crunchy vegetables, sweet cranberries and tangy blue cheese. It's a family favourite, perfect for potlucks. Toss the chopped pear with lemon juice to prevent browning. 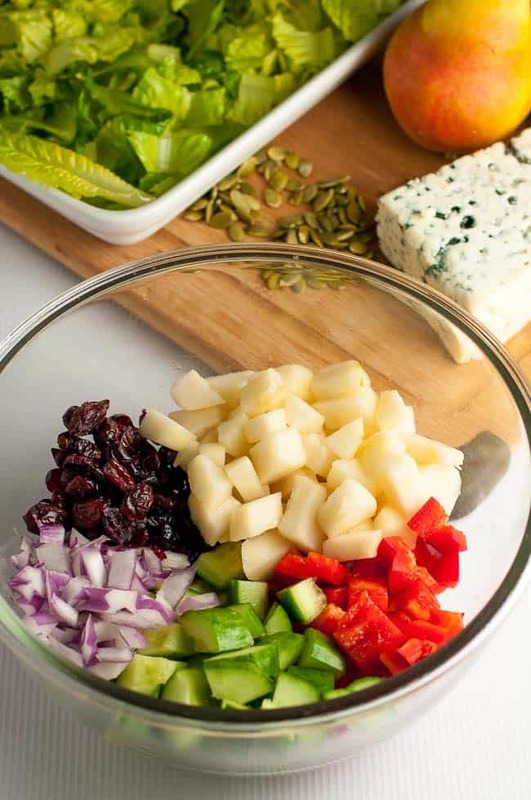 Put the pear, pepper, red onion cucumber, and cranberries in a bowl. Toss with olive oil and vinegar. Arrange chopped romaine lettuce on a serving platter or bowl. Top with pear mixture and garnish with blue cheese and pumpkin seeds. Wouldn’t this dress up our Thanksgiving table and be a nice change! 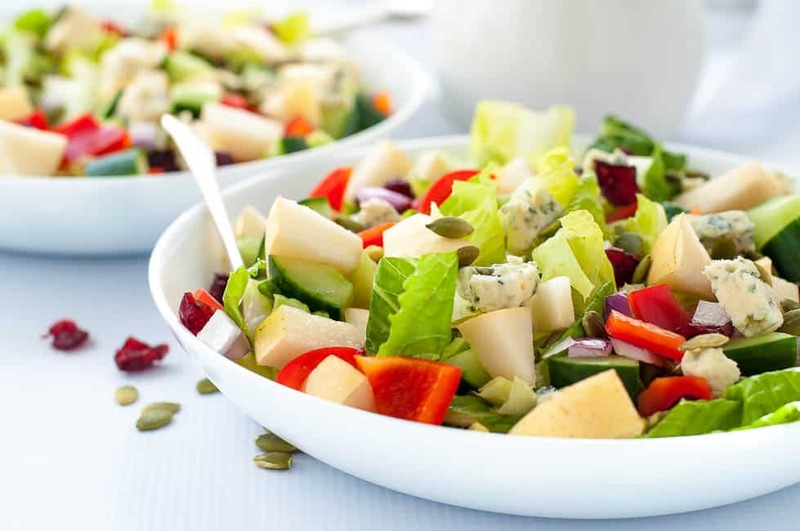 Lovely salad…I love chop chop! Whenever I feel like a different salad I can go no further than yours. Always tasty, different and really liked by my family. We live in Brisbane so it’s always BBQ weather here. This salad will be introduced at the next BBQ. Thanks for this Elaine. I’m so envious of your BBQ weather! The sun is peeking out now, but it’s bound to be a rainy week here. Someday we’ll make it to Australia!! Thanks so much for your kind words! I made this salad for dinner tonight, substituting feta for the blue cheese for personal preference, and it’s fabulous! I plan to put it on my Christmas menu this year. Oh, that’s great! Thanks for letting me know, Cathy! That’s a favourite of ours, too!